Milk contains fat in the form of relatively big globules initially so that a layer of fat would build up. In a homogenization process, the particle size is adjusted to the required level. The Globulyser is a routine analyzing instrument for measuring the size of fat-globules in milk and milk products. 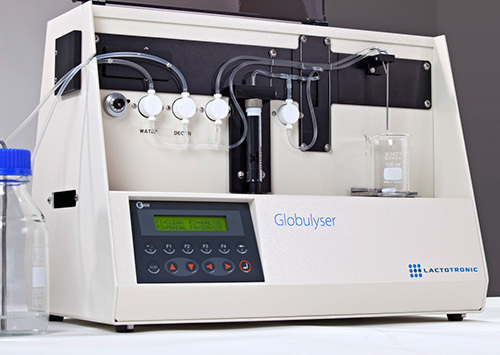 The Globulyser has been developed in cooperation with the Dutch Dairy Industry for analyzing and determining the homogenization degree of all long shelf life products, like UHT milk, condensed milk, pasteurized milk, a mixture of milk fat with vegetable fat, milk powder, cream powder, whey powder. Free fat in milk powder is a fundamental problem. With the help of the Globulyser, the free fat percentage can be calculated, for instance in milk powder. There is a correlation (R₂) of 0,98 between the values from the Globulyser and the free fat percentages. To give an example, the chocolate industry wants to have free fat in milk powder, because it does save cocoa oil. In contrast, the manufacturer of milk powder for baby food does not desire any free fat in the product, as the free fat is forming a fat layer on the milk, when it is dissolved in water. Besides preventing oiling off due to long storage, the Globulyser can reduce the energy costs for industrial homogenization. The correlation between the pressure of the homogenizer and the values of the Globulyser is (R₂) 0.995. Our homogenization degree tester is a routine measurement instrument that gives you the possibilities to measure quick (4 to 5 minutes) and operator independent. It is easy to use and offers the same or better precision than the particle size analyzers. The measurement principle is based on the intensity of transmitted and forward scattered light due to the present fat globules in the milk or milk product.